1. Mix soya milk with vinegar, add salt and salad oil. 2. 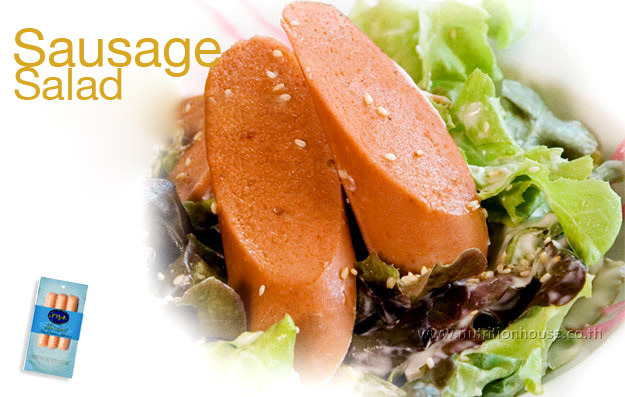 Defrost the sausage in a microwave for 2 minutes then slice afterwards. 3. Gently break the mixed vegetable into slightly larger than bite-size pieces and place in a bowl. 4. Add the sliced sausages. 5. Mix the dressing with lime juice, pour into the bowl and mix just before serving. Garnish with Sesame seeds and sprinkle parmesan cheese over.